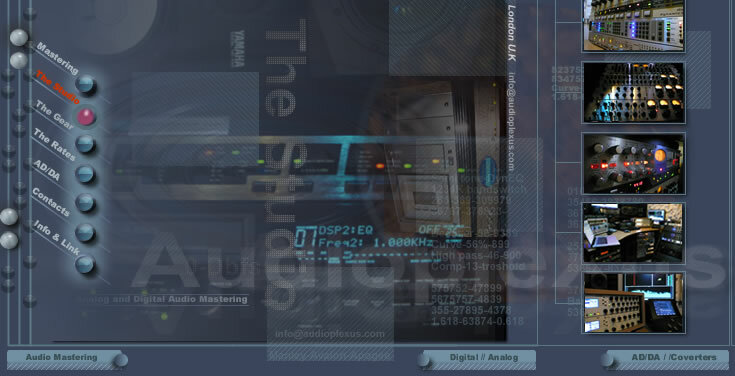 Mastering State of the art Mastering, A u d i o p l e X u s,+44(0)2089808947 London UK. MASTERING and CD mastering is the moment for putting the final polish onto a album or single. The last chance to make sure that everything fits together seamlessly and that everything sound right The secret for great mastering is the blend of many skill traditional and state of the art equipment in a well balanced acoustics.and off course a expert engineer.Mastering demo CDs is becoming a standard practice in the hyper-competitive music market. It's easy to see why record label A&R departments are deluged by demos from aspiring artists. Mastering of demos can be an important step in giving an artist an extra edge over the competition.Don't leave your mastering to chance; have an experienced and objective ear take your mixes to the next level. All projects receive a free test cd for approval; before any master cd's are created. Clients also have the option to have their music mastered over the internet via FTP file transfer, Mastering Our philosophy: Pay very close attention to detail and give personal service to every project. In digital production, level has traditionally been measured on a sample-by-sample basis. The highest possible level in a digital encoding is called 0 dBFS (or Full Scale Digital, FSD), and the only thing to be concerned about is not to hit that ceiling with too many samples in a row. However, a signal which needs more headroom to reproduce than a sine wave peaking at 0 dBFS can easily exist in the digital domain. We refer to such signals as "0 dBFS+", and haven’t found a single professional or consumer CD player that doesn’t significantly distort when subjected to them, and many of them even prolong the effect: They latch-up, and take a little while to get out of the distortion mode again, hence a period of time after a peak has occurred will also be distorted. Audioplexus Works are 100% guaranteed. People ask us why we need so much gear. Well it's very simple- you can not do pro mastering with just a computer and a few plugins (and its only digital) and two monitors.When your product is finished it will be listened to on many make of speakers and monitors so if you're doing it with just a computer the sound is only as good as your sound card Software mastering recalculates the numbers (samples) and if used too aggressively, causes some shrinkage of the sound stage and makes it sound more sterile, when compared to analog mastering.. Everyone knows that if you want to attract people to listen to your music it better be the best sound possible and that is where the state of the art gear matters- without them you could do it yourself and get a very good result but probably not a professional sound.That is what makes your music sound the way you want -the precision and accuracy of digital and the warmth of the analogue tube. If you would like to have a sample mastering done on one song, please send it to us along with postage cost for return shipping.We'll master it and send you a sample cd back with your original mix. Make sure you contact us so we know it's on the way . Or Contact us for a FTP file upload. State of the art mastering studio London-+44(0)20-8980-8947-Photo by Owen Davies-Design By AudiopleXust - info@audioplexus.com-Navcool group Plc © ® TM All Right Reserved 2004 2012.